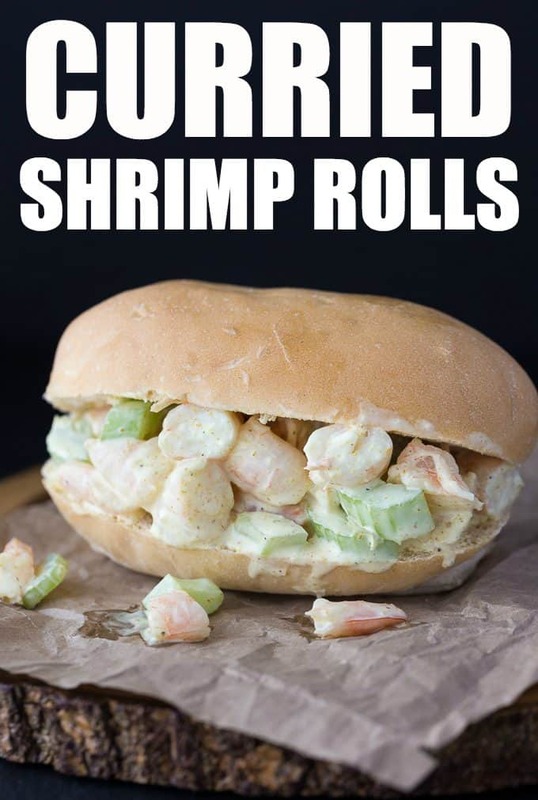 Curried Shrimp Rolls are light and bright seafood sandwich that is calling your name. 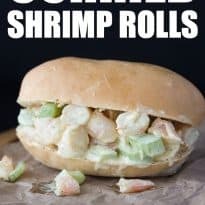 My shrimp roll recipe is creamy, full of savory shrimp, and packed with a little heat. 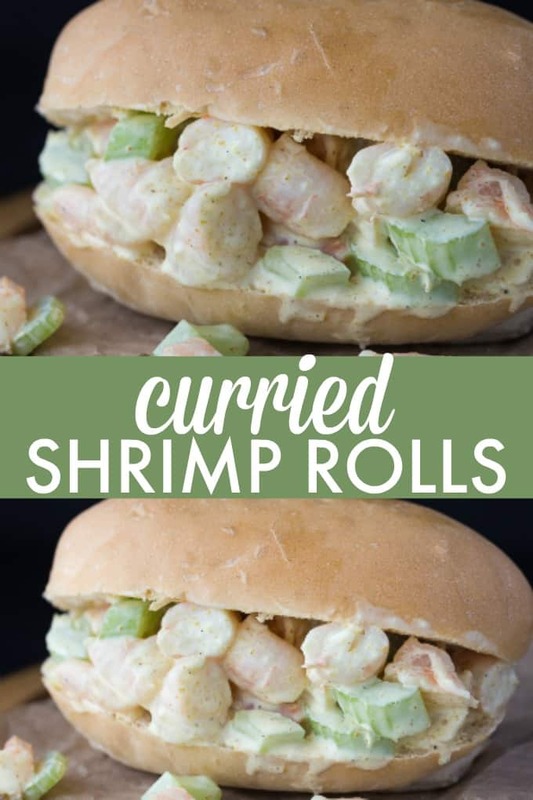 If you enjoy seafood, you might find my Curried Shrimp Rolls to be the perfect lunch or dinner option you have been looking for. Skip the classic tuna or chicken salad and whip up a batch of this curried shrimp. It’s going to be just what you need to power through the rest of your day. Pair with some salty chips, fries, or even a pasta salad. This is my go to lunch in the warmer months of the year! It’s so light and refreshing, but filling so it holds you over till dinner time. Yes, I do. I use precooked shrimp that is deveined and peeled. This curried shrimp is a cold salad so using pre-cooked speeds up the prep on my end. If you want you are welcome to cook raw shrimp and then chill it off in an ice bath for this recipe. Peeling and cleaning shrimp is easy once you get the hang of it. If you buy shrimp that hasn’t been peeled or deveined these tips could help you. If you buy pre-peeled shrimp that’s been deveined, you might see the price is higher. So if you want to save money, here is how to do it yourself! Start by grabbing underneath at the feet of the shrimp. Lift and pull the legs back to the tail. This will pull the shell off. Then make a slit in the back of the shrimp to expose the vein. Slide your knife or a wooden skewer under the vein and lift to gently pull out the vein. Rinse shrimp under cold water after. Then cook and chill shrimp for the salad! See it is pretty easy, and after you do a few you will get the hang of it a lot faster! You can reach for any type of bun for these. I tried rolls, Hoagie style, hot dog, hamburger or a homemade roll. I find they all taste really good, and soak up the sauce of the mixture adding more flavor to the bread! Just buy what you and your family likes or what you can find on sale! I have even bought slider style buns to serve at cookouts for a party. Nothing beats a small bite size sandwich! Get creative on toppings you use for your shrimp rolls! Eat them plain or dress them up, either way, these sandwiches are phenomenal! We generally eat them alone or add in some lettuce for crunch! Generally, we pair with some salt and vinegar chips or even plain chips. But you could do potato salad, pasta salad, fries, coleslaw, or whatever you think pairs well. In a bowl, you want to mix your mayo, lemon juice, and curry powder. Use a whisk to ensure all the lumps get out. Add in your salt and pepper as well and stir. Then add in your chilled cooked shrimp and celery. With a spoon, stir until incorporated. Grab a bun and spoon in some of your shrimp salad and serve! If you have leftover curried shrimp salad, just place in an airtight container and place in the fridge. Use the mix up within two to three days. When you are ready to use it just grab a bun and top and eat. If you put premade rolls in the fridge, they will become soggy. Give this Curried Shrimp Roll a try this spring or summer. It is an excellent and light lunch option, or great for meal prepping for a few days. It is our favorite way to eat shrimp in the hotter months out of the year. Have you tried Curried Shrimp Rolls before? Creamy with a hint of spicy, this delicious sandwich hits the spot for lunch. Mix together the mayonnaise, lemon juice, curry powder, and ¼ teaspoon each salt and pepper. Add the shrimp and celery to the mixture and stir. Serve on the buns of your choice.